Green Map has had a long and rich history in Japan, with dozens of maps made in different regions all around the archipelago nation. In fact, the first Green Map Hub was organized in Japan in 2002, providing regional mentoring and support to local leaders in Japan, and later, within Asia. Although its website is currently offline, Green Map Japan was expertly led by Misako Yomosa of Kyoto and Masahiro Horiuchi of Setagaya-Tokyo. Both were already publishing exemplary Green Maps of their own cities and supporting others by 2000. This was an important time for community engagement and several Hub meetings and trainings took place. Foundation support from JUCEE and the Japan Foundation, plus extensive press coverage helped jump-start the Japan Hub. 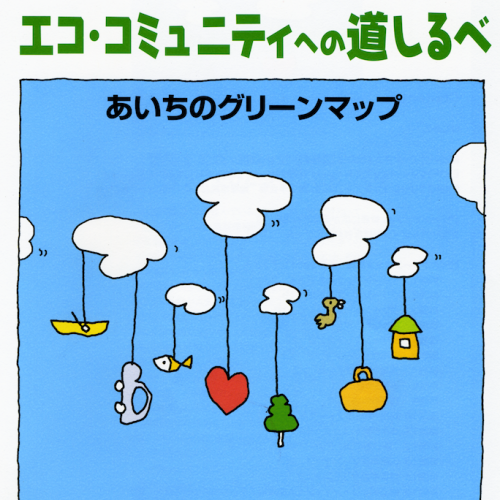 In March 2002, the cover story of Lapin map magazine gave readers an exciting introduction to the Green Map System, our universal Icons and locally published Green Maps from Japan and other countries. An ongoing partnership (see below) with Asahi News helped reach audiences of all ages, and made local Green Map stories national news. Led by Yohei Yasuda and David D’heilly, with support from Tama Art University and Masahiro Horiuchi, a high-visibility Green Map Project using six different icons to chart Tokyo’s sustainability ahead of the awesome Yamanote-sen Green Map exhibit, Tokyo Art Jungle in 2003. 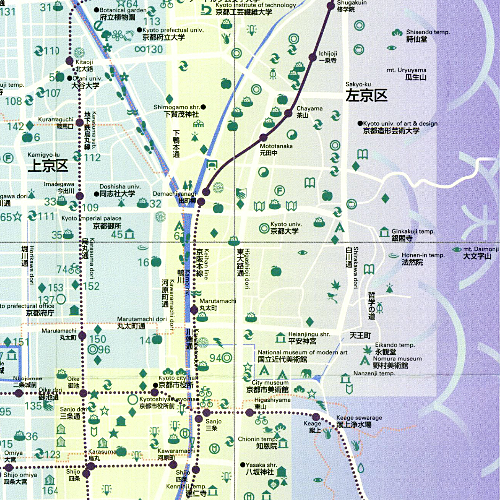 This led to many Green Maps, such as the Green Map around Asagaya Station Kids Edition, Tokyo - 阿佐ヶ谷駅周辺グリーンマップ　キッズ編, which empowered children to make a Green Map of their own. Later, a terrific ‘summer homework’ Green Map project called 'Mirai (which means the Future), involved hundreds of schools. Eventually, there were 70 Green Map projects of all scales were underway in Japan, some of which continue to this day. The largest initiative was Aichi Green Map, formed in response to the World’s Fair of 2005, and continues to do great work! Green Map Japan’s resourceful and inclusive approach to Hub development has been closely observed by other regional (Latin America, Europe) and thematic (youth, watershed, bicycle resources) Hubs as they got started and learned from their experience. The Asian network met in 2005 and 2007, involving several countries, and leading to projects like the Green Map Impacts book. We especially love the Biodiversity Green Map made in Aichi in 2010 - see more at their book linked on the left. Our director was invited to write an article on the topic, too. In 2011, when the major earthquake struck Fukushima, Green Mapmakers took part in the relief effort too, as noted in Green Map Japan's annual report. More outcomes followed, such as the ShareMap.jp the "Cool Sharing" energy-saving project by Masahiro Horiuchi, which led to the establishment of summertime cooling centers that spread from Tokyo across the country, and later, to warming centers. This history has made Green Map Japan one of the major international hubs for Green Map System and helped inform residents about the potential about Green Maps nationwide. Rie Nakamura and Keiko Nakagawa continue to lead this effort forward.